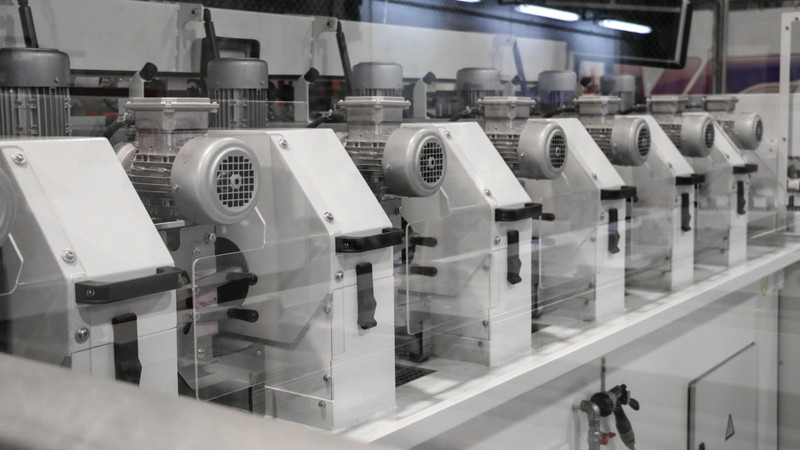 MLW100 6Z AT is an automatic solution for high-quality tube finishing which provides a completely autonomous operation from the operator. Being capable of processing not only round tubes but also some irregular profiles, this machine brings huge advantages to the tube finishing and polishing applications. 6 stations design: removing imperfections from tube surface up to a very fine roughness values. Automatic loading and unloading systems: process independent from the operator. ML Planetary System: minimum vibration even on the biggest lengths. Flexible finishing: besides round tubes, oval tubes, D shaped profiles, slotted or drilled tubes can be processed. Mobile touchscreen control with option for programs saving for future use. Integrated automatic filtration system and automatic finishing stations washing mode. 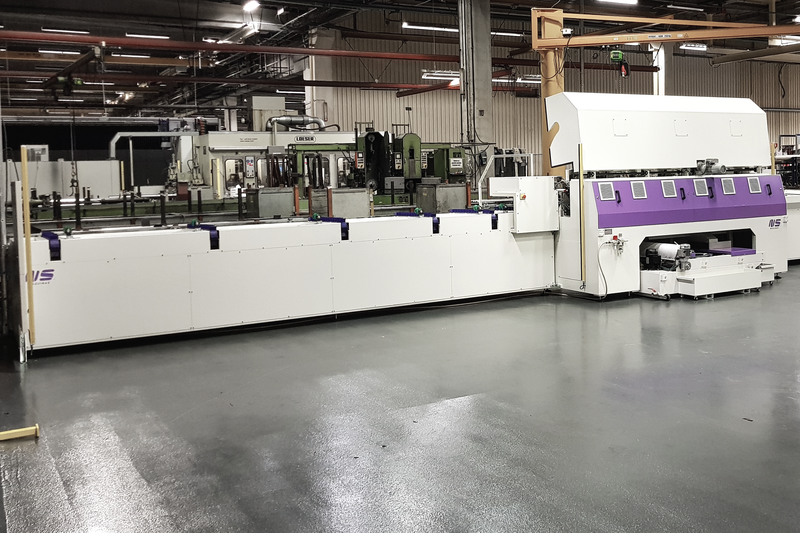 NS Máquinas has just developed a flexible 6 stations automatic tube finishing machine which counts with upgraded loading and unloading systems. MLW100 6Z AT wet tube finishing machine benefits from the ML Planetary System. 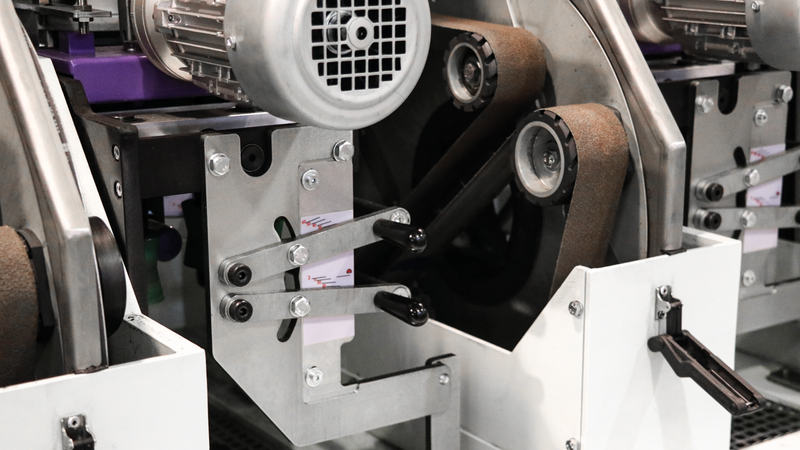 This system, already present in all NS Máquinas ML solutions, consists in 2 abrasive belts which rotate around the tube while the tube is passing through the finishing heads. Since the tube is not rotating, as it happens with other tube finishing systems, the vibration is minimal. This is especially an advantage when we consider long tubes (6 or 12 meters) or large diameters. 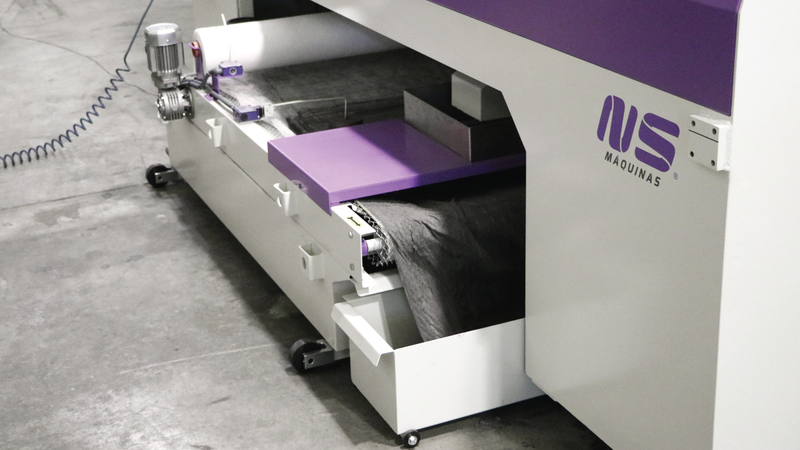 Although the standard machine is offered up to Ø114mm, NS Máquinas has models which finish tubes up to Ø310mm. 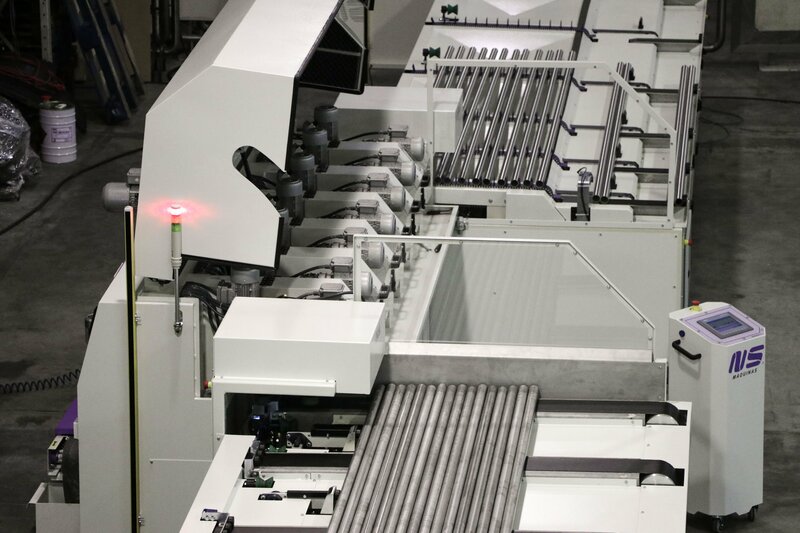 The automatic loading and unloading systems developed turns the complete process independent from the operator. From the moment the tubes are placed on the loading table, all the tube transport is carried automatically. The tube is inserted into the planetary finishing heads by a set of rubber rollers and travels through the 6 stations. The abrasive belts are actuated, station after station, by the signal of sensors. After the last station, the tubes are again handled by rubber clamping rollers which bring the tubes to an unloading station where these are kept separated from each other, avoiding any type of minor scratch. In this way, a perfect final finishing is assured. One inspection area can also be supplied at the end of the unloading table. A different number of stations can be supplied. A 6 stations design enables to remove imperfections from tube surface and to deliver a very fine roughness which can even be below 0.1 Ra. Such high level of the fine surface can be suitable either for stainless steel polishing or in case of steel and brass, when a further final coating is applied, such as chrome plating. Also in this application, removing every little imperfection might be crucial to guarantee that no minor defect will be visible after the plating process. Nevertheless, set-ups with a lower number of stations are also available in order to meet different application requirements. MLW100 6Z AT can finish tubes from 360mm long up to 6m. More, tubes with different lengths can be processed in the same batch. Despite the main application for these machines being round tubes and pipes, due to the ML Planetary System’s flexibility, different shapes can be finished by request. 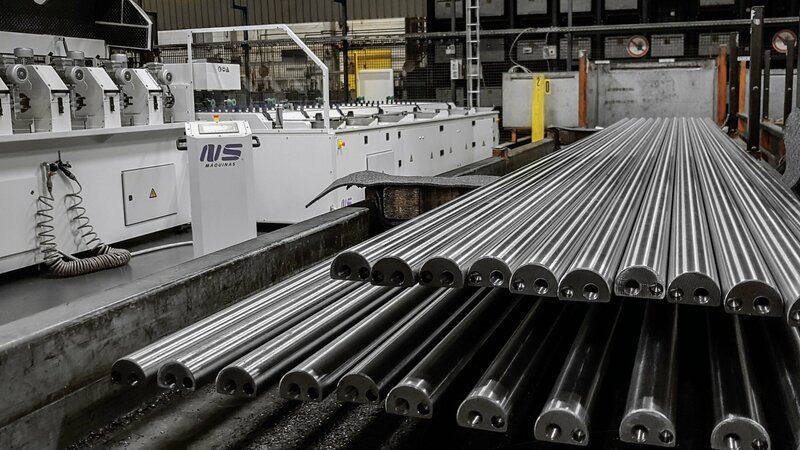 Oval tubes, D shaped profiles, threaded rods, slotted or drilled tubes can be processed, keeping the quality and maintaining the reduced vibration which this system provides. A demonstration video with these functions is available on the producer’s website. The machine features a water cooling system. This automatic filtration and pumping system cools down the temperature of the tube. This is particularly significant as the number of finishing stations rises. Also, this equipment dispenses dust filtration systems as the water is directed to every finishing station and is continuously keeping these areas clean. Especially when processing potentially explosive metal dust, this system is a safe, simple and reliable solution. This equipment is incorporated on the machine body and easily slides out for paper filter replacement and cleaning. Warning messages are displayed on the machine touchscreen any time the water is going lower than a minimum level or the paper filter is over. High safety standards were applied to this machine. Multiple safety devices were incorporated to guarantee operator’s safety all around the machine. Sensors were installed around the active areas of the machine and physical barriers on moving elements. Laser safety fences, warning sounds and lights were also applied. 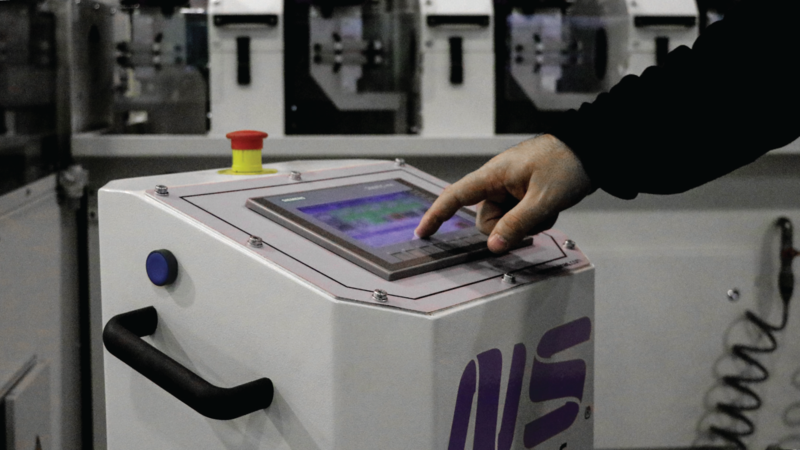 MLW100 6Z AT counts with a powerful mobile touchscreen control where the main functions can be actuated. Choosing the stations which will do a certain job, fine adjusting each abrasive belt speed and combining with a selected tube transport speed can be done from this control unit and, more can be saved into programs for future use. Tube diameter for the feeding and loading systems is automatically adjusted from this mobile unit. Staged finishing is also possible to perform with this same control. Selecting only certain areas of the tube to be finished and defining which stations will perform it can be easily programmed and stored on the provided control system. The software enables to start automatic finishing stations washing when the machine is not operating. Also, it includes Energy Saving System which will switch off the finishing heads whenever a tube is not being processed. 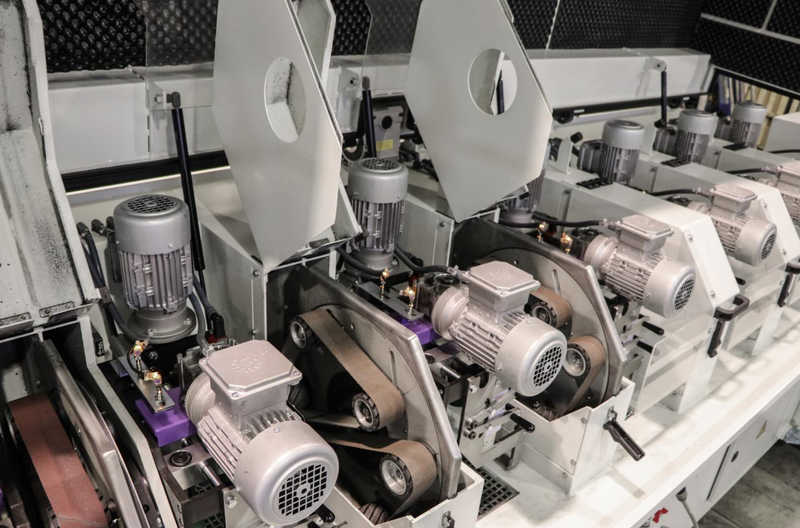 This feature is a good help in keeping a reduced consumption of wear parts, as a more efficient use of bearings, v-belts and rubber rollers is now possible to achieve. 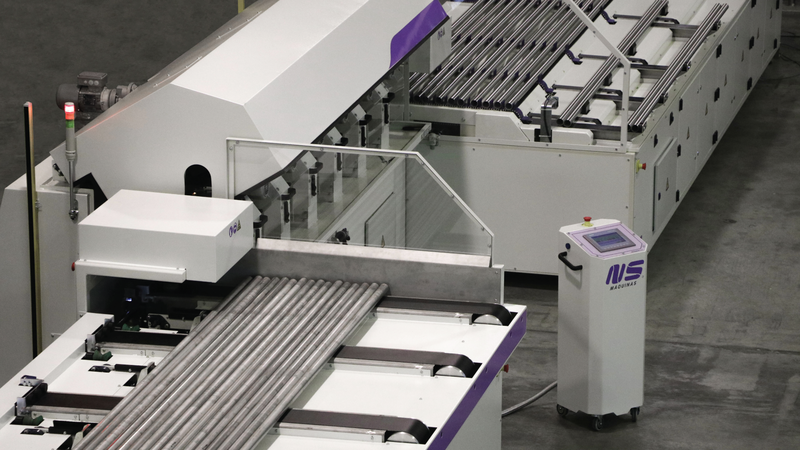 MLW100 6Z AT is an automatic solution for high-quality tube finishing which provides a completely autonomous operation from the operator. Being capable of processing not only round tubes but also some irregular profiles, this machine brings, therefore, huge advantages to the tube finishing and polishing applications.